Gordon Trueman (seated) and wife Tammy Stewart (standing behind and to left) with Benefit Committee members Front row from left to right - Diane Perrin, Ella Stewart, Kim Bernier, Marc Bernier (kneeling). Back row from left to right – Marcel Perrin, Doug Byrne, Frank Stewart, Dave Slater, Guy St. Hilaire, Robert Bannerman. Missing – Caroline St. Hilaire, Darrell Hanson. The public’s overwhelming generosity and support, enabled the Gordon Trueman Benefit committee on February 13, to present Trueman with an interim check for $37,000. The funds raised will help to pay for expenses related to his recovery and upcoming surgery in Toronto. On June 4, 2011 while attending a Vern Sapergia clinic, Gordon was involved in a horse related accident which landed him in hospital with a broken pelvis. While in hospital Gordon developed some life-threatening complications that resulted in more than 28 surgeries to save his life. The proceeds were raised through private donations and a month long campaign by the Benefit Committee, culminating in a supper and dance held on February 4, at the MacDowall Hall. A crowd of over 350 people gathered to show their support for Gordon and to add their contributions through auction purchases and raffles. Some traveled hundreds of miles to attend this event and to get the chance to visit and “catch up” with Gordon and other family and friends while at the same time being able to help Gordon. The live auction was comprised of over 30 donated items ranging from artwork, horses and horse related items to wedding photo packages. The auctioneer and MC for the evening, Doug Byrne, ensured that every item was sold to the highest bidder, which resulted in the live auction raising over $9,000. Additionally, over 130 various donated silent auction items were auctioned throughout the evening. The Benefit Committee would like to send a sincere and heartfelt thank you to all those that attended the benefit, bought tickets, sent money, donated items for the silent and live auctions and/or volunteer their time. It was “nice to see everyone come together and help someone who has probably helped them in some way at one time or another,” stated Vanessa Senko, Prince Albert resident and benefit attendee. Trueman has always been involved in horses in one way or the other- from working on ranches, managing a riding arena, 4-H, roping, penning, trail riding. He also has a tremendous fondness for his heavy horses, using them for chores, cutting and hauling hay, or giving sleigh rides. He has made many a child’s day by giving a Christmas sleigh ride followed by a good snuggle from his team of horses. He has always had a love for horses and the joy that they bring to people of all ages. Trueman is an Equine Canada Level 1 coach and is involved with the Saskatchewan Reining Horse association and Saskatchewan Horse Federation. Over the last 15 years, he has been instrumental in teaching and coaching youth within the Prince Albert area. 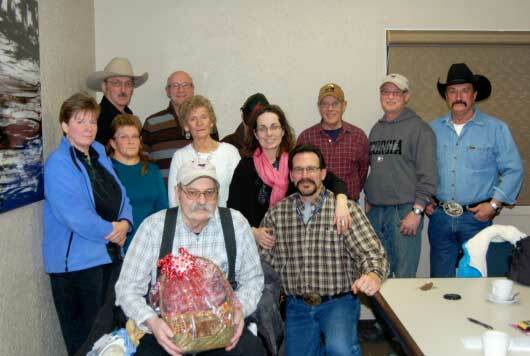 He has donated countless hours with various 4-H clubs assisting youth to improve their riding abilities.